Here we are again at the beginning of the year and you have signed up for an early summer race. Congratulations, you have picked one of the most scenic road races in the country! Whether you are running the full or half marathon, and are a veteran or newbie to the distance, I hope to give you a few things to think about as training heats up. A bit of planning and preparation will hopefully ensure that your Steamboat Marathon experience is a great one. First off, part of having a good race is to make sure that logistics are in place and taken care of to decrease hiccups. Managing outside stress is absolutely part of a smooth race. Start looking at lodging and airfare, and book early to ensure that you get something you are happy with; thousands of people come to Steamboat Springs for marathon weekend and it will be busy. We have many wonderful options in Steamboat to fit every budget. You can stay in town, up by the ski resort, or in between. If you will not have a car I might suggest downtown so you can walk to the bus start, we do have an excellent public transportation service in town as well. Second, start forming a training plan. If you are new to the distance I would suggest an online training plan with weekly mileage recommendations, you can find these for almost every level of experience. You may also think about hiring a coach to keep you on track; the accountability of a coach is wonderful. You can find coaches that work via distance or someone in your home town. If you are working by yourself the biggest tip I can give you is to incorporate specificity to the course. You live in the flatlands? Find one small hill and run up and down it as many times as possible. No hills? I suggest getting on the treadmill and cranking the incline for some running up and downhill. I’ll get more into this in later blog posts but do not be swayed into thinking this marathon is a mostly downhill course, there are hills and they are at altitude. You also must prime your quads for the sustained downhill section after the first few hills at the start. Lastly, but most importantly, start thinking about your nutrition! I have worked with all types of athletes from never ever beginners to Olympians, and everyone in between. The best recipe to success is to have a solid nutrition plan everyday, not just on race and training days. I will go into more detail about nutrition and diet in later blogs but here are a few tips to get you started. Do not get swayed into fad diets, period. They come and go, and with them the pounds go and always come back. There is always something new out there and the one similarity is that they don’t work in the long run. Eating whole foods, a lot of plants, and including complex carbohydrates, good protein sources and healthy anti-inflammatory fats are key. You need to fuel yourself first, and success will follow. Do yourself a favor and get your diet in order now. Many RDN’s, registered dietitian nutritionists, like myself have sports nutrition backgrounds and specialties in the field. Seek out someone credentialed in your home town or work with a RDN via distance. Having your diet analyzed with your training is an amazing tool. Start getting creative with your meals as well, and maybe buy a new cookbook or two. One of my favorites is Shalane Flanigan’s Run Fast Eat Slow, this cookbook has wonderful recipes for GF, vegetarian, and omnivorous dishes. Ok runners, have a blast as you ramp up your training plan, and I’ll check back with you in a month or so with some more tips to keep you healthy and motivated! The 2019 Steamboat Marathon will be Cara’s 22nd running of the event. 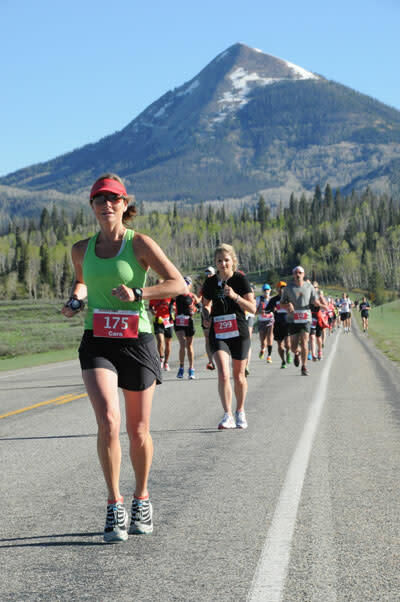 She lives in Steamboat with her husband and six year old son, owns a private nutrition counseling practice, and is an avid ultra runner and skier. You can learn more about Cara by clicking here.